Last weekend Goliam Praz asked me to make a thin-crust pizza. After some research in my cooking books and online, I decided on this delicious and 100% reliable recipe from America's Test Kitchen. As it is always with pizza making, one must decide the style first and then the toppings. 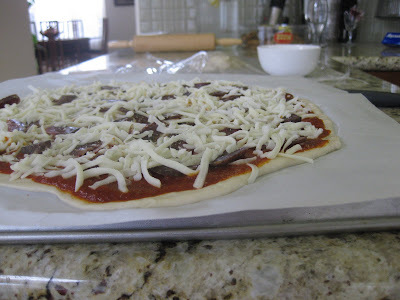 Since we had already chosen the style, the toppings had to be minimalistic... thin-crust pizzas call for light toppings. Bulgarian lutenica, very popular and well known from our childhood as "Hortze", named after the dancing people on the front label served as the perfect tomato sauce. Asy many of you know, it is hard to find this particular brand in the US. Actually, I saw it only once at the International Food Bazaar, and stocked up well by buying a full box of 12 jars :). 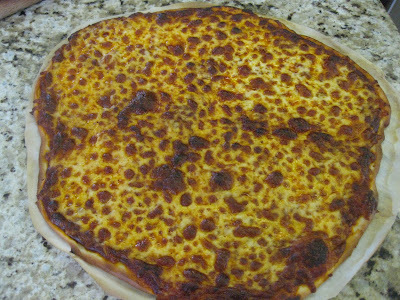 An important factor for making a good pizza is the cheese for the topping. If it is very moist, it will make the crust soggy. 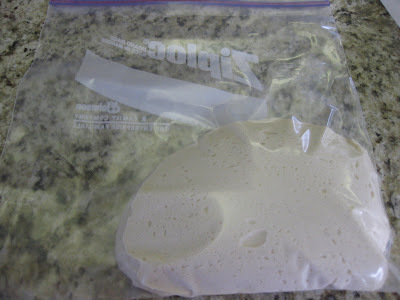 I remembered seeing in Costco's freezer section bags of low moisture part skim Mozzarella cheese. We had a trip to Costco with the sole purpose of buying this cheese. 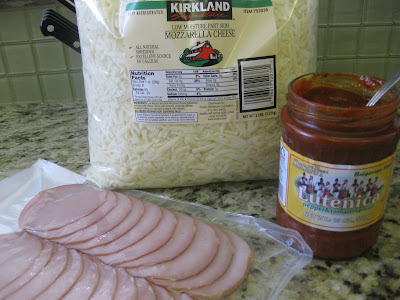 Initially, I planned to use Canadian bacon for a topping, as you see from the picture above. After a quick consultation with GP, I changed my mind. 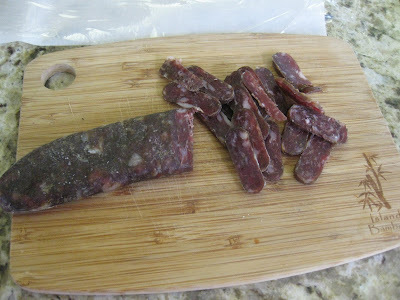 He suggested thinly-sliced home made lukanka ( this is a Bulgarian style salami) as a better alternative. STEP 1: For best results use food processor, fitted with a dough blade to make the dough. First pulse 1 3/4 of the flour with the rest of the dry ingredients. With the machine running, add the water, the oil and the honey. If needed ( the dough is very sticky) add the rest of the flour. 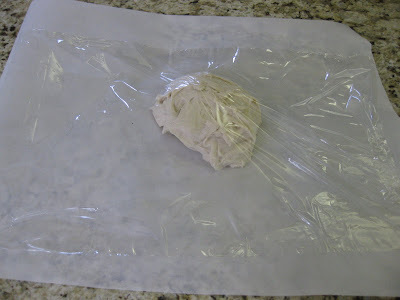 Divide the dough in two and store it in 1-gallon zip bags. It can stay overnight in the fridge to rise slowly. STEP 2: Since I don't have a pizza stone, I used two cookie sheets to bake the pizza. Heat the oven to 500F with the first cookie sheet placed upside-down on the middle rack. I used the second cookie sheet to transfer and slide the pizza on top of the cookie sheet in the oven. 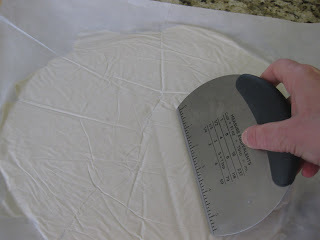 STEP 3: Prepare two large parchment paper sheets, and place the dough in the center of it. Cover with two overlapping plastic wraps. Let it stay for 10 minutes. STEP 4: Roll the dough with a rolling pin into a 14-inch round. 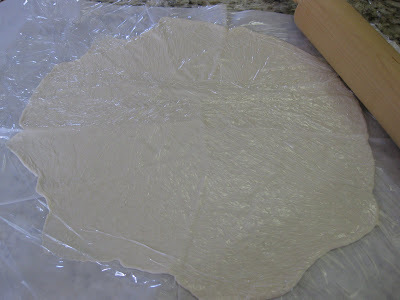 STEP 5: If the parchment wrinkles, flip the dough over and use a bench scraper to smooth the wrinkles. STEP 6: Move the dough on top of the second cookie sheet and peel out the plastic wrap. Spread the tomato sauce, or lutenica in my case. It takes about 1/2 cup to cover the pizza. Arrange the rest of the toppings and cover with 1 cup cheese. Cut out the parchment with scissors, so it won't get burnt in the hot oven. 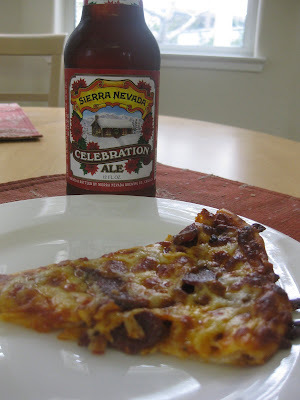 STEP 7: Slide the pizza onto the cookie sheet in the oven and bake for 10 minutes. Cool for 2 minutes until crisp. Meanwhile prepare the second pizza and bake it in the oven. Je pense que cela devrait être la meilleure réplique de montre que j'ai jamais achetée. soldes montres Je partage ce site avec mes amis. Ils sont très contents, leur prix est si bas,luxe pas cher Audemars piguet montres et je peux acheter une si bonne montre. Faux Trahana - Happy Birthday Sweet Lokuma! Mystery Live Blogging: Guess what's cooking!! !